"The public is more familiar with bad design than good design. It is, in effect, conditioned to prefer bad design, because that is what it lives with. The new becomes threatening, the old reassuring." 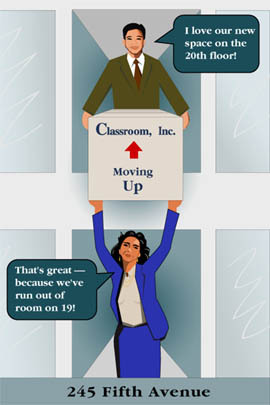 This image was a postcard design used to notify customers that Classroom, Inc. is moving from their suite on the 19th floor to the full 20th floor of the same building. My first concept was a close-up photograph of elevator buttons where "Classroom, Inc." was crossed off on the 19th floor and written in next to the 20th floor button. Then I had the idea to draw some cartoon characters handing a box from one window to another.. up one floor. As you can see, the latter was chosen. Some of this companies products are computer software simulations designed to be used in the classroom to teach certain lessons. I redrew two of the characters from such a simulation in Illustrator and repositioned them as seen here.